If you are interested in this package, please send us a quick inquiry. How would a person feel if he is told that he is going to join the human settlement surrounded by the virgin nature and wonderful creatures at the highest elevation of the world? It is not only hard to believe but it also seems something beyond our imagination. However this trip will make you realize that it is not only a day dream but a truth one can experience. The place is really divine where everything is in its natural state untouched by any other depiction. Once a person is there his or her desire accelerates to know more about the place and its wonders. This place is far behind from the reach of modern facilities and development. ‘Dolpa’ is geographically the largest district and one of the remotest districts that lies in the mid western part of Nepal. The varieties of flora and fauna in the unexploited vast nature are the delightful gifts of nature found in this province. There used to be a time when the entry to the upper region of this district was restricted for the foreigners. However, this has changed and it’s open for all the tourists with especial permit for those who want to explore the nature at its best. Several explorers, investigators, experimenters have visited Dolpa for their own interests. Although many people have explored many parts of this region, there still are lots of natural wonders left to be explored. 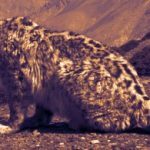 The “Snow Leopard” is one of the most stunning endangered big cats found in this Himalayan region. It is a carnivorous that is on the top of the food chain. It survives mostly on weaker animals like blue sheep, jharal, marmot, musk deer, etc. Though people take this animal to be dangerous and aggressive it is not, instead it is very shy in nature. However the numbers of its prey is gradually decreasing forcing it to hunt the domestic animals when it doesn’t find its prey in the wild for several days. This annoys the local people and encourages them to attack this animal in order to protect their cattle. Actually, this beauteous animal loves to remain far from other creatures because it is peace loving by nature. The threat of extinction of this beautiful creature is increasing due to the invasion of its habitat and diminishing numbers of its prey. The reason concludes: Increasing human population disturbs its habitat as they expand pastures for the survival of their domestic animals. Secondly, the chain of food habit that has to be controlled. People hunt the prey of Snow Leopard, for their own interests which increase the scarcity. Hence the Snow Leopard is being enforced to encounter the domestic ones. Therefore, the disturbed situation in their habitat and food chain may lead the whole eco-system towards critical future. One can’t be satisfied unless he or she canvasses the creature that remains on the top of the eco-cycle and is the most beautiful wild creature, “Snow leopard” the Himalayan queen. Ultimately, we have designed a tour package to fulfill such a desire to observe Snow Leopard, its natural actions in its native habitat. This expedition is fully service oriented that aims to provide excellent service to our respected clients and to support the protection program of this endangered beautiful creature by providing knowledge to the concerned people about the importance of conservation. This itinerary can be change as per your interest and time frame. Day 10:Nangdalo Base camp rest day. Our airport representative will receive you with warm welcome and lead you to the hotel. A briefing by Snow Leopard specialist (Mr. Kamal Thapa) will be organized, if possibly with slide show. You can also interact with him. You will be also briefed about your schedules of the following days. We take a flight on any domestic carrier that takes 55 minutes to Nepalgunj. Nepalgunj is a town in the western Terai, very close to the Indian border. It is a major trade hub for western regions of Nepal. Overnight stay will be at three star hotels. The flight takes 35 minutes to Juphal airport of Dolpa. Our trekking starts from Juphal descending through local villages of Juphal. 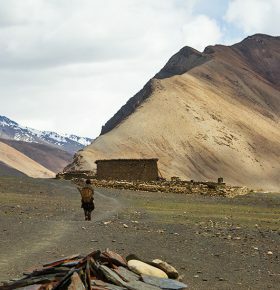 Following the path along the riverside we reach the district headquarters of Dolpa, a small village called Dunai (2150m). Here are the government offices, police check post and some other service centers. All the official procedures are carried out here. We stay overnight in Dunai either at Pala Guest House or Blue sheep Trekkers Inn. Here you can also have an evening walk to the Bon Stupa, Buddhist Central Gompa and the first public school “Dunai Boarding School” just across the river Bheri. We enter the Shey Phoksundo National Park and its headquarters at Suligard while trekking towards Chhepka, which has a few houses and lodges in the surroundings of wood. On the way one can have fun and enjoy bird watch. The trail goes up and down along the forested riverbed and several streams on the way which soothes your heart. The trail continues along the valley to the camping site. We will camp for a night or stay in lodge at Chhepka. We start the trek to Polam through forests of big cedars towards Palam a winter settlement used by the people of Ringmo village. On the way we can also visit the Bon School “Tapariza” on the way. We start up the dusty trail to a ridge at 3780 meter viewing the highest waterfall in Nepal (200 m). Our route then continues into Ringmo village, a picturesque settlement of flat-roofed stone houses with lots of Mani walls. We camp at the national park camping grounds to the west of the lake. We take a day to explore the area around the magnificent Phoksundo Lake. The lakeis famous for its magnificent turquoise color and spectacular scenery. Many beautiful glaciers can be viewed above the lake. There are many monasteries (Gompas ) and Bon-po religious sites at the park and we will visit some of the very old and important monasteries. We will explore the natural sites and enjoy our nature tour. Moreover, if we are lucky enough and make a way around the lake we may catch a glimpse of the very precious and endangered species the Snow leopard. 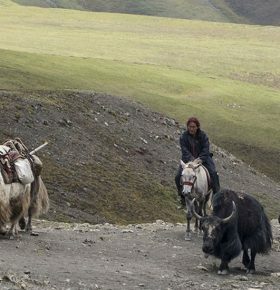 From Phoksundo we will start our journey by the side of lake climbing the stiff trail which you might have remarked in the movie “Caravan”, where a yak was fallen into the lake. We trek along the precipitous and narrow trail to the western side of the lake. We can have clear views of the peaks Shey Shikkhar and Kang Chunne, both just over 6000 meters. The trail then descends to lead us to Sallaghari our camp for the night. The place is in the woods, surrounded with snow capped rocks. From Sallaghari, we trek up to Nangdalo base camp. We will go through the pine forest along with several brooks flowing through where the tunes of different chirps of birds make our walk pleasant. Day 10: Nangdalo Base camp rest day. The potential area in the Base camp where the snow leopard can be spotted is Perikopa where we will spend most of the day looking for it. 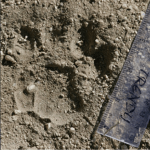 We can observe foot prints and droppings of Snow Leopard along with its preys. We will have ample chance to see the Snow Leopard in this area. Our trek begins towards Shey from the base camp crossing the Nangdalo Pass (5350M). Shey Gompa is one of the famous and oldest gompas of Dolpa, which is located nearby the holy mountain, called ‘Crystal Mountain’. The famous Shey Festival occurs here once in every 12 years, “The Dragon Year”. A red chorten marks the entrance to Shey, where we camp for the night. The area around the Tshakang gompa is one of the most potential areas to spot the Snow Leopard as recommended by the SL specialist Mr. Kamal Thapa. So we stay here for 2 days and wander around this area as there is a greater chance to encounter this beautiful creature in natural way. 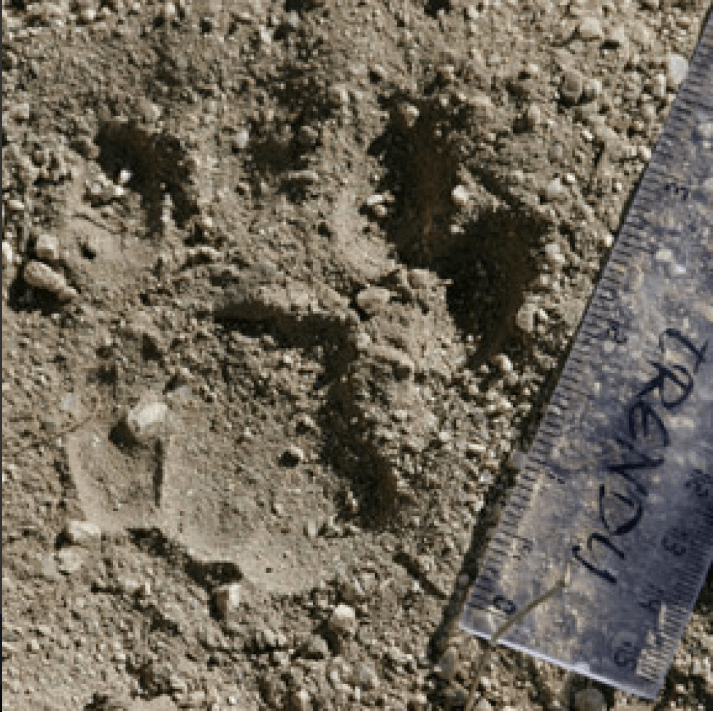 Many people have noticed the foot marks/scratches left by the big cat near their houses. It is believed that it likes to consume salt and various marks can be found in the salty rocks found around the villages. The abundance of Blue sheep around the area also increases the possibility of occurrence of the Snow Leopard in this area. After staying 2 days in Tshakang gompa and around, we head towards Tata. We leave Tata to lunch at Shyalming. Shyamling is actually known as the oldest Bonpo gompa of the nation. Tantrike lamas like Sherap Tenjin of this gompa is famous for his tantric knowledge. 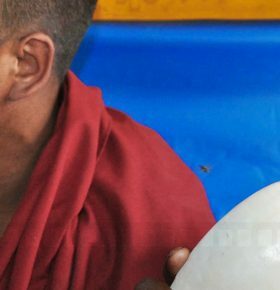 We will have an interaction with the lama. After the lunch we will interact with the local people. One can gather interesting folklores about the snow leopard from the aged people with their mixed experience of joy and sorrows. The people in this village know a lot about snow leopard because these people encounter them every now and then. 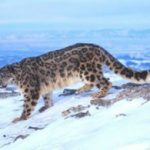 They have good knowledge about the habits of snow leopard and they also have long experience on how to protect both their domestic animals and the endangered big cat. WWF Nepal has assisted the locals to encourage them in the conservation programs by providing technical knowledge and financial support. They have formed the Snow Leopard conservation groups to guide the locals. Today walk to Nengla High Camp from vijer. This area is potential for Snow Leopard. The people have encountered with the big cat very often in this region. 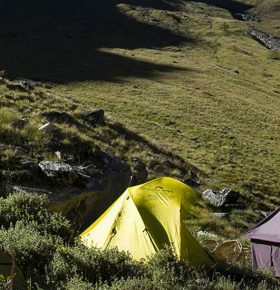 From Neng La High Camp we trek to Saldang crossing the Nengla pass 5368m. WWF Nepal has also supported the locals to form the Snow Leopard conservation groups in Saldang. 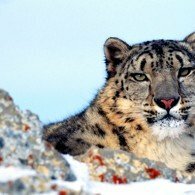 The group is active in the conservation so the numbers of snow leopard is increasing gradually in this area. Thinly Lundup the leading actor of Caravan movie who has been awarded with Abraham Conservation Award also resides in this village. In this trail we will have a straight walk to Chhore gaon where we camp. Though there are several villages on the way, the place where we will camp has cluster of three or four houses only. 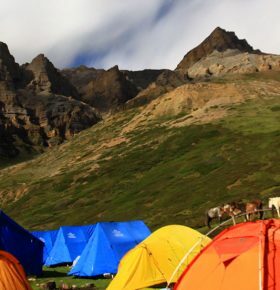 Today we trek from Rakyo (Choregaon) to Jyanta La pass camp. On our way from Jyantala pass camp to Dho Tarap we will be crossing the pass Jyanta 5221m which is also known as Chyngla pass. Most of the time, we receive mild precipitation on the pass. The trail is calm without any human disturbance. 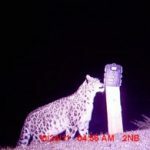 On this trial we will be able to see the prey of Snow Leopard and sometimes Snow Leopard too. The settlement of humans at the highest elevation is in Dho VDC the village is known as Khangar (4440m). You can gather more knowledge and legends from the villagers about the big cat. Sometimes people encounter the Snow Leopard in the village itself. It is pleasant and wide spread valley where you can enjoy other natural and cultural heritages. 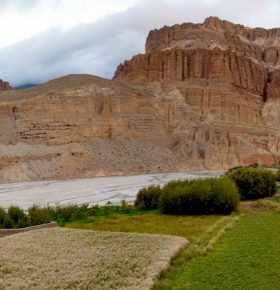 After taking a glance at the glorious heritage we start the trek from Dho and enter a highly potential habitat of Snow Leopard, Lang valley and Mirbhu, the pasture lands, where the local people make the shades for their cattle. 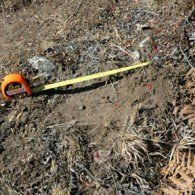 Here we will have thorough surveillance of the area, the habitat of Snow leopard, ‘Lang’ the valley and “Mirbhu” the pasture. We have ample chances to spot the Snow Leopards around this place. We camp here for the night. The trek descends to Thajam through rocky hills surrounded by fir and pines. We will be descending towards the hilly region from the mountain desert. So, it will be a joyful walk along the riverside with beautiful sightseeing and bird watch. We will start the trek ascending a little having the view of Putha himal and Dhaulagiri range then descends through rocky trails to Tarakot. Above the camping area there is a village where the people use to speak a typical language “Kaike”. From Tarakot the trail gently descends through small clusters of houses on the way. You can view several places for winter settlements. Then we will re enter the district headquarter of Dolpa, Dunai Bazar. Leaving Dunai we will head the only air strip, Juphal to spend the last night in Dolpa. You can enjoy and share experiences with all your companions. 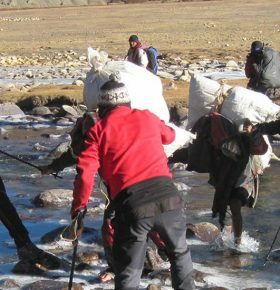 The porters will depart for their homes after days of trekking. You will reach Nepalgunj by an early flight. From Nepalgunj you will fly back to Kathmandu. Finally a traditional Nepali farewell dinner will be organized in Kathmandu. Please fill up the form below as complete as possible and hit on submit button. If you wish to discuss any aspect of our trips for your suitability, please contact us by Telephone or Email. Upper Dolpo with Dolpo Festival.